GIS Day 2011 Celebrates in Style! Organizations all over the world united on November 16 in a celebration of geospatial intelligence. Since 1999, GIS Day has been celebrated on Wednesday of Geography Awareness Week. Over 80 countries participated in 2011's GIS Day celebrations, spreading the wealth of spatial thinking to communities around the globe. The dynamic nature of GIS makes each year's GIS Day an exciting opportunity for organizations to share their challenges and successes from the year and catch up on innovative new applications. Events celebrate the many uses of GIS; from emergency management to facility management and mining to forestry, the diverse array of GIS applications makes this occasion a perfect chance for interdisciplinary communication and holistic advancement of technological aptitude. 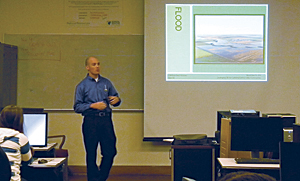 In addition to encouraging conversation across disciplines, GIS Day helps introduce the many uses of GIS to new markets. 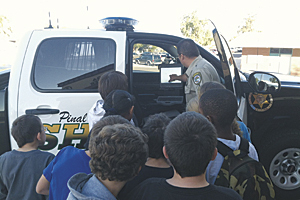 Pinal County, Arizona, students learn about the use of GIS during emergencies. This year, the Bureau of Land Management (BLM) Butte Field Office held its inaugural celebration of GIS Day by inviting junior high- and high school-aged students from Acadia, Montana, to learn about careers in GIS and the natural resource community. The Butte Field Office manages over 300,000 acres, with GIS playing an integral role in overseeing everything from forestry to cultural paleontology. 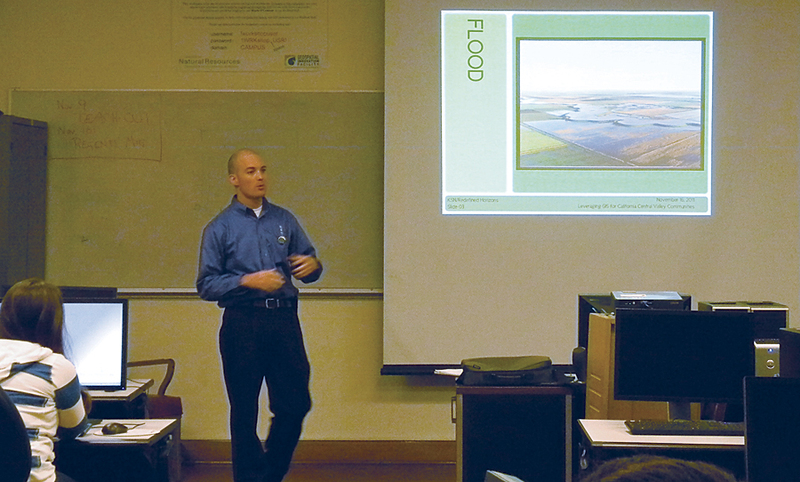 For its first GIS Day celebration, the Butte Field Office adopted an educational approach focused on inciting youth interest in GIS technology. Volunteers from BLM treated students to a short presentation on how the Butte Field Office uses GIS for natural resource management and analysis and educated them on the benefits of pursuing a career in GIS. Students were encouraged to participate in a free-form ArcGIS workshop and had the opportunity to work with ArcPad on GPS units. "Allowing students to jump right into ArcGIS has proved very educational for them," says Bradlee Matthews, GIS specialist for the Butte Field Office. "Their creativity really shines." 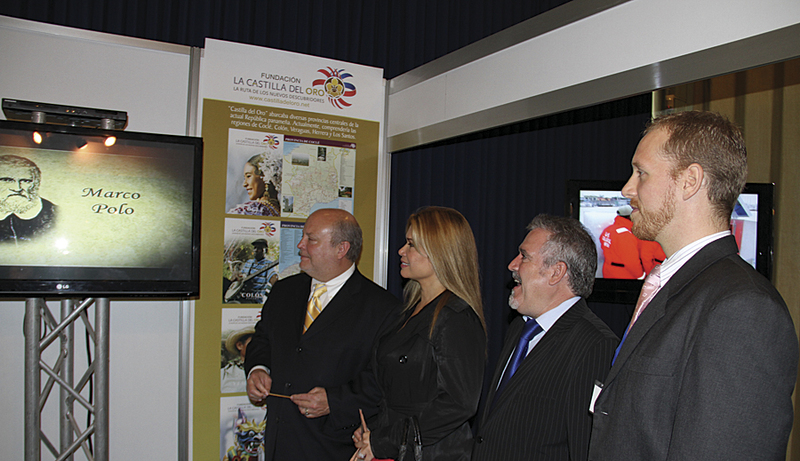 The Republic of Panama celebrates GIS Day. In the Republic of Panama, Geoinfo celebrated GIS Day with a series of activities held at the Ciudad del Saber Convention Center with more than 450 attendees. Participants included government agencies—the National Authority for Government Innovation and the Panama Canal—as well as private corporations and educational institutions. The day started with guest speakers covering advances and technological innovations in the GIS industry. Other important topics of discussion included the upcoming Metro transportation system in Panama, the 311 line for government innovation, and Esri tools available to users. In the afternoon, a series of nine tracks were presented covering a variety of topics, from A Basic Understanding of GIS and Its Technologies to more specific topics, such as GIS Implementations in the Panama Canal. Presentations were followed by a Map Gallery contest, with winners selected by public vote and GIS expertise. The event concluded with traditional Panamanian dances, and a closing speech from the company's president, Alan Richard Winstead. In the Golden State, the University of California, Berkeley's (UC Berkeley) Geospatial Innovation Facility partnered with the Bay Area Automated Mapping Association to host a free conference event for local GIS users and anyone interested in learning more about GIS. Held at UC Berkeley's Mulfort Hall, the conference featured presentations and posters from students and professionals and provided an opportunity for discussion and networking for participants. In addition to the informative aspects of the conference, attendees had a chance to work through an exercise using GIS. The event was also supported by the Northern California Region of the American Society for Photogrammetry and Remote Sensing. All the organizations involved are passionate about promoting GIS as a tool for solving real-world problems and enhancing research. Total Business Solutions Ltd. (TBSL), Esri's distributor in Belize, hosted its first GIS Day Expo. Consistent with the theme "Discovering the World Through GIS," TBSL, in collaboration with Belize Telemedia Ltd. and Belize Tourism Board, focused on educating students and adults on the important role GIS plays in their daily lives. The GIS Day Expo began with an official opening ceremony for various guests, from distinguished members of the business sector to eager and bright-eyed primary and secondary school students. Speakers discussed how to interpret and analyze information in a new and dynamic way. Loretta Garcia-Palacio, managing director, TBSL, welcomed the students and invited guests and gave a brief overview of TBSL's initiatives aimed at promoting the use of GIS in Belize. "It is important to introduce our students to this type of technology at a very young age," says Garcia-Palacio. "GIS is a new way of spatial literacy for Belize. The world is going through a geospatial revolution—everybody is now pointing to a map. And we don't want our students to be left behind." GIS Day at the University of California, Berkeley. In Pinal County, Arizona, government employees visited Florence K–8 School to educate over 250 students about the use of GIS for emergencies. Now in its fourth year of celebrating, Pinal County puts on GIS Day events that spark growing community interest and expand public participation. County workers introduced students to the Public GIS website and provided tutorials on tools and functions for querying information. This year's event also featured a county Command and Communication vehicle and the Pinal County Sheriff's cruiser to ignite students' imaginations and demonstrate the functionality of GIS in vehicles. Additionally, the town of Florence demonstrated the maintenance of utility data and emergency hydrant locations using GPS and mapping with GIS software. There was also an open house and a map gallery containing aerial photographs of local historical features and state geography. If your organization is interested in planning an event for GIS Day 2012 (November 14), make sure to check out Esri's generous resources and support. With helpful sample agendas and presentations, white papers, and details about previously held events, Esri can help you take your event to the next level. Esri also offers promotional materials to get the word out about your celebration. With e-mail signatures and postcards, as well as a variety of printable flyers, invitations, and posters, it's easy to ensure that your event is well publicized. In addition to assisting with the planning and promotion of your event, Esri also offers a wide variety of GIS Day paraphernalia to make your event memorable. See gisday.com/support for more details.